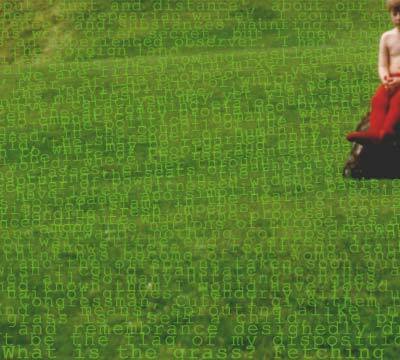 The text at the bottom is from Walt Whitman's poem Leaves of Grass which begins with the phrase: "A child said What is the grass? Fetching it to me with full hands; How could I answer... "
The green is filled with a pattern of texts by authors from countries that have been colonialized by the English with one text by a Persian author who came to study in Oxford. The bottom text is from Walt Whitman's Leaves of Grass, in which he seeks to find an American voice expansive enough for a continent. Another text is from Janet Frame sho speaks of her dislocation as a New Zealand writer, between English literary influences and the uncertain beginnings of a New Zealand voice. The third text is from Witi Ihimaera's The Matriarch: here the matriarch is informing her grandson of his roots which are imbedded in the world of nature. The fourth text is from Shoghi Effendi, a Persian who came to Oxford in the early 1920's to study western thought. He seeks to create as awareness of the patterns of global change. 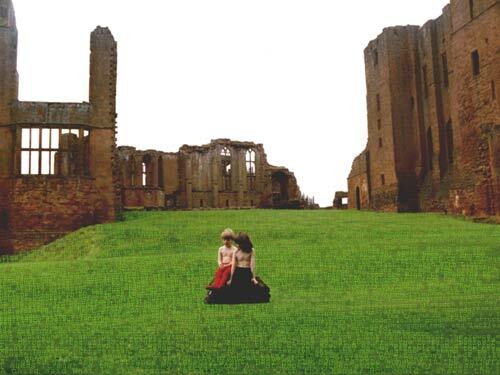 The ruins are of Kenilworth castle in northern England. The children are my own.